The Whistler Cruisader is a complete and comprehensive laser/radar solution for motorcycles and other recreational type vehicles. The Cruisader allows discrete laser/radar protection with many installation options. Not only does this unit provide a stealthy installation but also delivers very powerful protection from the newest laser/radar guns, especially POP Mode detection. Power On And Self-Test: Each time the detector is turned on, an automatic self-test sequence confirms that the audio (if equipped with optional Voice Module) and visual displays are functional. Display: The LCD shows the detected signals as well as battery voltage, air temperature, Aux out selection (LED, Tone or Voice Module) and volume level selected. Memory: All features selected, except Stay Alert and Quiet Mode, are retained in memory. Audio Level Adjustment: If the optional Voice Module is connected, the audio levels can be adjusted high to low, or low to high, in eight steps. Auto Quiet Mode: If the optional Voice Module is connected, Auto Quiet reduces the selected audio level to level (1) approximately 5 seconds after a radar or safety radar signal is detected. The alert for any new signal within 20 seconds will resume at level (1). Auto Quiet does not affect VG-2 or laser alerts. Quiet Mode: If the optional Voice Module is connected, Quiet Mode cancels the audio during an alert and any new alert within 20 seconds. After 20 seconds, approximately 2 beeps are provided on any new alert and the unit then remains quiet. City/City 1/City 2 Mode: Whistler's Three Stage City Mode is designed to reduce the annoyance of automatic door openers, intrusion alarms and other devices that share frequencies with police radar. In City Mode, weak speed/safety radar signals give an initial alarm of two beeps (if equipped with optional Voice Module), and then remains quiet unless the signal becomes very strong. In City 1 Mode, only the X band sensitivity is lowered. In City 2 Mode, X-band is not detected. Speed Radar Audio/Visual Alerts: When X, K or Ka is detected, the band ID and signal strength is displayed. If the optional Voice Module is connected, the audio alert is continuous and has a Geiger counter-like pattern. The faster the beep, the closer or stronger the radar source. Pulse Protection: If the optional Voice Module is connected, when a pulse type signal (instant-on strong signal) is detected, an urgent 3-second audio warning is sounded. Even without the Voice Module, the display will show "Pulse." Laser Audio/Visual Alerts: When a laser signal is detected, the word "Laser" and signal strength is displayed. If the optional Voice Module is connected, an audio alert is continuous for a minimum of 3 seconds. VG-2 Audio/Visual Alerts: When a VG-2 signal is detected, the detector "hides" its own radiated signal and becomes undetectable by the VG-2. A text message confirms detection of VG-2. Every 30 seconds, the detector checks for a VG-2 signal. If a VG-2 signal is still present, the unit continues to hide and repeats the VG-2 alert. If no signal is detected, two beeps are provided (if equipped with optional Voice Module), indicating an "all clear" condition. Alarm LED: The supplied LED connects to the Aux output on the control panel. The LED flashes to indicate signal detection. The faster the flash rate, the stronger or closer the source. Safety Warning System Text: In communities where transmitters are located, the Safety Warning System displays over 60 text messages. Stay Alert Feature: If the optional Voice Module is connected, you can use the Stay Alert Feature to test your alertness. Within 30-60 seconds of turning this feature on, two beeps are sounded and the LCD backlight flashes. To show alertness, the driver must press either the B/L, City or Quiet button within 3-5 seconds. If the button is pressed within 3-5 seconds, the cycle is repeated. If a button is not pressed within 3-5 seconds, an alarm sounds and the display shows "Get Rest." Temperature/Voltage Mode: The unit can be programmed to display either the outside temperature or battery voltage along with Highway/City modes. The Ice Warning Mode alerts you when the temperature drops to 32°F. Alert Priority: When two or more signals are received at the same time, the alert priority is: Laser, VG-2, Speed Radar, and Safety Radar. Communication Breakdown: If a problem arises between the control panel and the laser/radar antenna, the unit will give a unique audio tone (if equipped with optional Voice Module), and the backlight will go to full brightness. 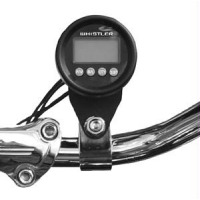 Optional Wireless In-Helmet Display: The Cruisader incorporate a built-in wireless transmitter. This transmitter sends laser-radar information to the optional wireless in-helmet display. The receiver provides a flashing LED that is in your peripheral vision. The LED flashes when the unit receives a signal. Laser-Radar Antenna: The laser-radar antenna is water resistant and designed to be mounted on a motorcycle, snowmobile, etc. Because the optimal location for mounting the antenna varies by vehicle type, the hardware supplied is designed to offer a wide variety of mounting options. The antenna can be attached to the vehicle in a horizontal or vertical position, or at any angle between these two points. To mount the antenna, you can use the supplied reflector bracket, universal brackets, or self-adhesive dual lock fasteners. The dual lock fasteners can be used to mount the antenna to almost any flat surface in your vehicle. For vehicles that do not have sufficient clearance or access (about 5") to mount the antenna in a horizontal position, the reflector bracket should be used. The temperature probe should be mounted far enough away from the engine and radiator heat but still in the airflow for the vehicle. Laser Antenna: This laser antenna has two uses depending on installation of the laser-radar antenna. The first is providing front laser detection when the laser-radar antenna installation does not allow for laser detection. The second is providing rear laser detection when the laser-radar antenna does allow for laser detection. The laser antenna can be mounted using the supplied dog bone bracket or self-adhesive foam pad. Control Panel: The installation package provides at least three ways to mount the control panel to the vehicle. Using the "V" bracket alone will allow attachment to an existing bolt on the vehicle. Another is using the handlebar clamp in conjunction with the "V" bracket. The handle bar bracket is designed to be used on any 1 inch to 1-1/4" handlebar tubing. The next way is using the dog bone bracket instead of the "V" bracket. Control Panel: W=2.417", H=2.417", D=2.842"
Laser-Radar Antenna: W=3.068", H=1.223", D=2.985"
Laser Antenna: W=1.457", H=0.791", D=2.573"
Whats in the Manufacturers Box? © 2018 BLINDER.NET ALL RIGHTS RESERVED.